Today we take a break from the ICW. It is a clear day with wind out of the south at less than 10 knots. The anchor is up in Town Creek in time to make the 9:30 AM opening of the Beaufort bascule bridge. Cutter Loose is headed to sea through the Beaufort Inlet. 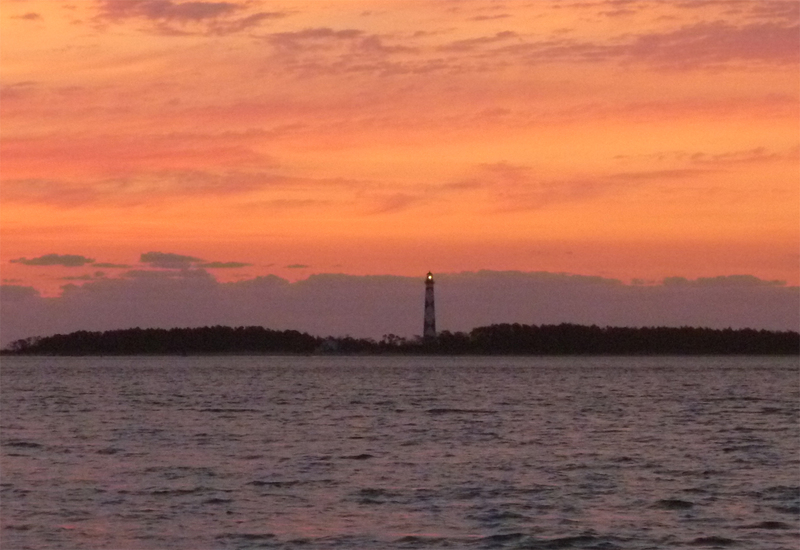 Our destination today is the bight at Cape Lookout National Seashore, just 11 miles from Beaufort harbor. 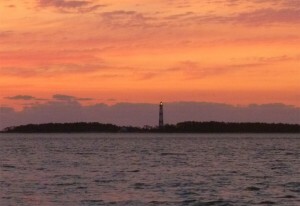 Cape Lookout is the southernmost point of Core Bank, which is not a financial institution but rather a natural barrier island. Our old nemesis, Hurricane Irene, made landfall here on August 27, 2011. The Cape is accessible only by boat, and today there are dozens of small fishing boats traversing the entrance to the bight at trolling speed. The bight inside the “hook” of the Cape is nearly a mile in diameter. Cutter Loose is one of a dozen boats anchored in this pristine setting, surrounded by an enormous circular beach. 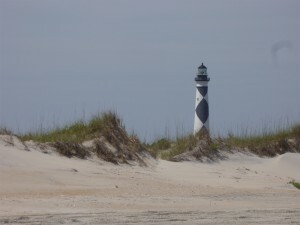 Surrounded by windswept dunes, the most prominent feature of Cape Lookout is the 210 foot lighthouse. A tour of the visitor center explains the constant reshaping of this fragile landscape. Beaches on the interior side of the Cape are continually receding while sand is constantly being deposited on the Atlantic beaches. 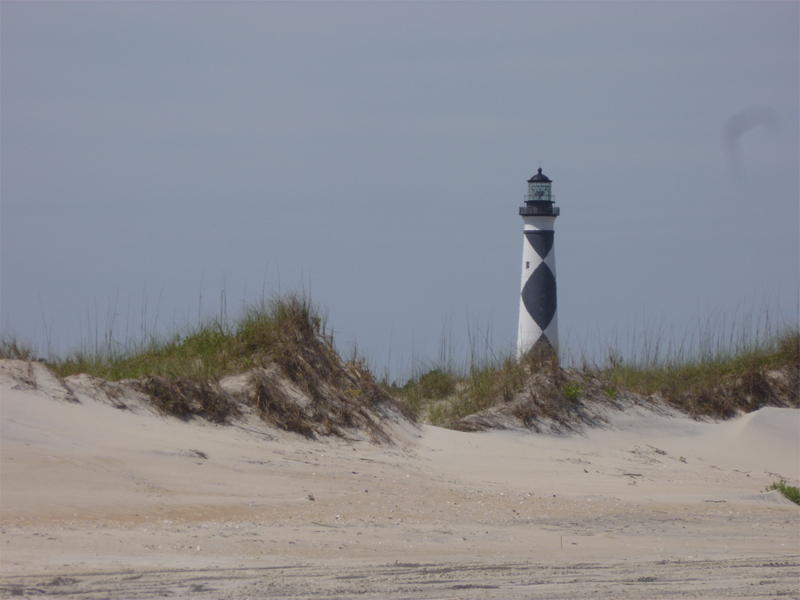 The beaches and dunes here remind us of what a barrier island should be…a place that is left almost entirely to nature for the purpose of protecting the mainland. On the Atlantic beach, surf casters are watching and waiting patiently for a hit. A handful of adventurous beachgoers are preparing to spend the night on the beach in tents. We stroll along the beach in search of shells until late afternoon when we board the dinghy, return to Cutter Loose and settle in for a tranquil evening on the hook. The sunrise on Sunday morning is a reminder of why we choose to live aboard a boat. The anchor is up at 8 AM. Cutter Loose retraces her steps to the Beaufort Inlet and under the Morehead City Bridge where we rejoin the ICW. Our destination today is River Dunes Marina near Oriental, NC, some 36 miles to the north. Our course takes us through Adams Creek and into the open expanse of the Neuse River. By 3 PM, Cutter Loose is refueled and in her slip at River Dunes. We take advantage of this opportunity to wash the boat and tackle laundry. This will be a one night stay. Tomorrow we will resume our journey north on the ICW.